As far back as elementary school, I decided that I wanted to be a journalist. Meeting all different kinds of people, always on-the-go, not staying in one place for too long, working with people with a similar – dry – sense of humor and writing for a living – what could be better? You also can’t forget that journalism, historically, has been a “public service” profession: Exposing injustices to the greater public, being a “watchdog,” holding politicians and others accountable for their words are just a few ideas that intrigued me about the profession. But most of all what inspired me to go to j-school at the University of Southern California was that someday I could draw attention to social issues – especially those underrepresented in the U.S. and internationally – through my reporting. And sure, I could do that. But the real question was: Does drawing attention to social issues actually motivate the readers to take action and do something about them? Maybe, maybe not. That’s why I was eager to put my reporter’s notebook on my bookshelf for good, ditch objectivity and actually fight social issues I had reported on previously or learned about. So, I decided to volunteer. This blog follows my journey serving in the U.S. with AmeriCorps for a year and for 27 months abroad with the Peace Corps. As part of the 2011-2012 City Year corps, I helped #makebetterhappen at Markham Middle School in the Watts neighborhood of South Los Angeles. I serve because I believe one person can have an impact on this world, even if it means just making a difference in one other person’s life. I serve to better understand humanity and the world we live in. I serve because I believe that the right to an equal education is the civil rights issue of my generation. 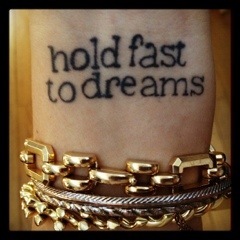 I got this tattoo on my wrist (a line from the poem “Hold Fast to Dreams” by Langston Hughes) after my college graduation to give me a daily reminder that I can never give up on my dreams and what I want in life. Passion is what drives me. I love what you stand for Liz, I think you will really go far. Thanks for becoming the kind of person who makes good things take place — who works to change things in reality for others. Hi! I’m heading to The Gambia on the 26th as a Primary teacher trainer! Have you found out where you’ll be yet? I just got my invite about a week ago. Good luck if you’re still waiting! Best of luck to you! I have not found out where I’ll be yet, but The Gambia sounds like an amazing place to serve. Hopefully I’ll be joining you! I stumbled on your blog after googling “peace corps staging” after reading your post I realized that something about your blog seemed familiar. I then realized that I was sent your blog last year while you were in CY because your team leader was a CYDC alum. I was a TL her corps year. I say all if that to say that I will be leaving for PC in Swaziland in June and it is good to see CY alums in PC. The world is truly a small place, good luck! Congrats on Swaziland! It’s pretty similar to SA culturally etc so if you have any packing questions feel free to ask me. I am planning on going to City Year South Africa’s Nelson Mandela service day in July, but you’ll be in PST during that time….maybe there will be other opportunities to visit CYSA if you’re interested. Good luck getting ready for the journey! I completely believe the youth are not to be ignored. They have not become as jaded as some of the adults have.